In this incandescent novel, a family's superpowers bestow not instant salvation but the miracle of accepting who they are. Okay, tell me which you want, Alek asks his cousin at the outset of "What the Family Needed." To be able to fly or to be invisible. And soon Giordana, a teenager suffering the bitter fallout of her parents divorce, finds that she can, at will, become as invisible as she feels. Later, Alek's mother, newly adrift in the disturbing awareness that all is not well with her younger son, can suddenly swim with Olympic endurance. Over three decades, in fact, each member of this gorgeously imagined extended family discovers, at a moment of crisis, that he or she possesses a supernatural power. But instead of crimes to fight and villains to vanquish, they confront inner demons, and their extraordinary abilities prove not to be magic weapons so much as expressions of their fears and longings as they struggle to come to terms with who they are and what fate deals them. As the years pass, their lives intersect and overlap in surprising and poignant ways, and they discover that the real magic lies not in their superpowers but in the very human and miraculous way they are able to accept, protect, and love one another. 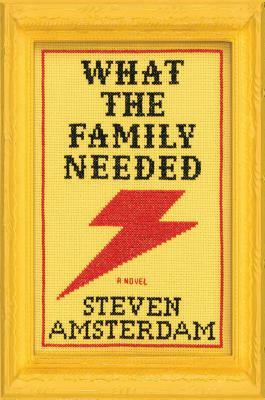 Steven Amsterdam is the author of "Things We Didn t See Coming," which was longlisted for the "Guardian "First Book Award and won "The Age "Book of the Year Award, among other honors. A native New Yorker and a nurse, he lives in Melbourne, Australia."